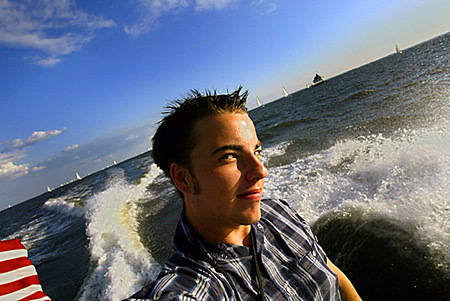 Chris Detrick on board the press boat while covering the 2004 Governor's Cup Yacht Race. I last wrote to you 10 weeks ago after having completed my first week at The Baltimore Sun. I have recently finished my internship and am back in Columbia, Mo., to complete my senior year at Mizzou. Looking back at the summer, I feel so very fortunate to have had this wonderful opportunity. In addition to photographing some very cool events and people, I have learned a great deal about myself as a photographer and photojournalism in general. This being my first official internship, I was very nervous about working at a major daily metro paper and having over 300,000 people see my images everyday. It was a big adjustment after having worked the previous semester at The Columbia Missourian, circulation circa 5,000. One of my biggest adjustments came in the form of expectations; expectations I had for myself, and expectations others had for me. Being surrounded by so many great photographers elevated my own expectations for my work. I never wanted to use the excuse that I'm just the photo intern. It was my goal to be able to produce story-telling images at the same level as the rest of the photo staff. At the start of the internship, I began to doubt myself and questioned whether or not I would be able to handle this challenge. My fears faded away as I realized that my education at Missouri had provided me with the tools necessary to succeed in Baltimore. Over the course of the summer, many of the lessons I learned in the classroom were applied daily in real life situations. Whenever I got an assignment that had been covered in previous years, I would search the archives for those images and talk with the photographer that shot them. This helped me to see how they handled the situation and also to get first-hand advice. If possible, it can also be helpful to talk directly to the reporter and/or their editor in order to get more insight. I would then use this information to brainstorm new ways to photograph the situation. This allowed me to come back with fresh and creative pictures from potentially routine assignments. Unnecessary embarrassment can be spared if a simple phone call is made to confirm the subject, time, date and place of an assignment. Even at big newspapers, mistakes are made in assignments, so it is best to double check before going out. This practice was added to my daily routine after a slightly embarrassing situation. My assignment was to make a portrait of a WWII veteran at his apartment in Little Italy. The assignment sheet listed the time of the shoot at 8:00 a.m. on Saturday morning. I arrived at his apartment at 7:55 a.m. to be greeted by a man still in his pajamas. He told me that the time of the shoot had never been finalized so he figured it was canceled. I apologized for the misunderstanding and asked if he would still be willing to have his picture made. He graciously changed into his old military uniform and I made my pictures. I could have avoided all of this by calling him the night before to confirm the time. 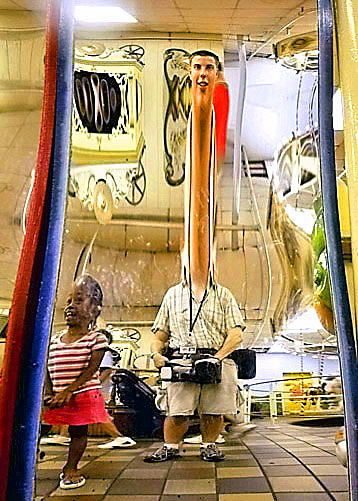 Self portrait in a fun mirror on the boardwalk at Ocean City. 3. Triple Check All Directions. Directions on an assignment sheet or even on Mapquest are not always accurate or ideal routes. To save yourself the stress of getting lost and being late or missing the assignment, ask an editor or photographer to verify the directions, especially if you are traveling into an unfamiliar city like Washington D.C., for example. It was also helpful to plot the route on a map. I always had road maps of Maryland, Washington D.C., Virginia and Pennsylvania in my car in case I got lost. I also found it beneficial to travel with a phonebook of the city I was working in. This was another lesson I learned the hard way after getting extremely lost on my way to photograph President Bush's campaign manager at his office in Arlington, Va. Lets just say that the directions on the assignment sheet were less than accurate, and I found myself driving around in circles on the opposite side of the Potomac River in Washington D.C., on a Friday afternoon during rush hour. With the help of my map and a few frantic calls to my assignment editor, I eventually found Mr. Mehlman's office...30 minutes late. I was kindly given exactly two minutes to make his picture for the front page of Sunday's paper. This headache could have been avoided by checking ahead to make sure the directions were complete and accurate. 4. Be Prepared for Anything. As photojournalists, we have to be ready to cover just about any event at any given time. This could mean photographing a church service in the morning, then covering flashfloods in the afternoon. I always kept a suitcase filled with different types of clothes in the trunk of my car. In it were old jeans, shorts, shirts and shoes I didn't care about. On the opposite end, I had a nice pair of pants along with a button-down shirt, tie and dress shoes. . In addition to clothes, I also packed an extra umbrella, step ladder, towels, plastic grocery bags, zip-lick bags, a first aid kit, flashlight, energy bars, bottled water, sunscreen, ear plugs, rain poncho, sharpie and a hat. Having these items available helped me out on many occasions. One such time was on a rainy Tuesday evening in July when I was asked to photograph flash flooding in downtown Baltimore. Although I wasn't scheduled to work that day, I jumped at the chance to cover spot news. The only problem was that my Doc Martins, khaki pants and button down shirt were not exactly the ideal apparel for covering floods. This problem was only temporary as I did a superman-like change into some old clothes and boots in the parking lot of the newspaper. I was then able to shoot the flooding without worrying about whether or not my clothes were getting wet and muddy. 5. Back Up Everything Immediately. Burning your entire day's work onto CD's at the end of your shift is a really good habit. Don't assume that just because you downloaded all of your images to the computer's hard drive that they will still be there in the future. Computers can crash or the images could be deleted. Err on the side of caution and back up your images. This was my unfortunate situation after having spent a day profiling Baltimore Ravens' owner Steve Bisciotti and his wife Renee at their home in Severna Park, Md. It had been a long and busy day so, when I got back to the office, I dumped all of the raw images onto a computer and went home. When I went back a few days later to work on them, a folder containing 200 pictures had disappeared. Luckily, the story was not going to run for another three days and the subject was willing to schedule a re-shoot. Save yourself the frustration of losing images by backing up everything as soon as possible. 6. Have Fun and Take Chances. As photojournalists, we have one of the coolest jobs in the world. We get to meet interesting people, go to fun places and use all sorts of cool equipment...and get paid for it! I can not imagine a better job. For me, it truly is an honor and privilege to be working in this profession. I look at each assignment as an opportunity to grow as a visual storyteller. In order to grow, I had to be willing to take chances and experiment with angles, lens choices and lighting techniques at my assignments. Even if certain ideas didn't work out, I at least learned what went wrong and could use that information to help me on my next assignment. Around 150 horses and ponies participated in the 79th annual Chincoteague Pony Swim Wednesday afternoon. In under ten minutes, they swam from Assateague Island to Chincoteague Island, where they will be auctioned off. One variable I enjoyed experimenting with was the point of view of my pictures. From chairs, benches, tables, and ladders, to trees, rock-climbing walls, slippery pig pens and roller coasters, I was constantly searching for things to climb in order to provide a unique perspective. One of my favorite images from the summer was made hanging upside down 60 feet above the Howard County Fair while riding "The Fire Ball" roller coaster. No matter what the situation, I pushed myself to make unique, storytelling images. 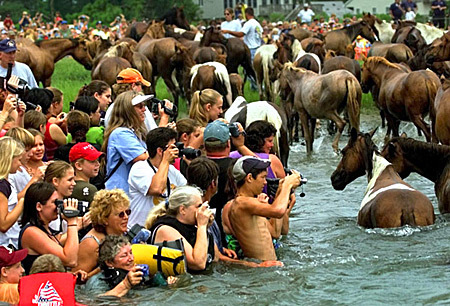 Of the 98 total assignments I had this summer, I would say my favorite and most challenging was the 79th annual pony swim in Chincoteague, Va. Every year, the Chincoteague Volunteer Firemen round up the wild ponies on Assateague Island and swim them across Assateague Channel to Chincoteague Island. The next day, the ponies are auctioned off in order to raise money for the fire department. This event is a magnet for thousands of tourists and horse enthusiasts, hoping to witness this unique event, and to possibly purchase a legendary pony at the auction. I had read about this event in the beginning of the summer and asked my editor if I could cover it. He agreed and I immediately started to plan my strategy. I began by studying the archived pictures and talking with the photographers who had covered it before. They gave me wonderful advice about what to expect and suggested many different possible ways of covering it. I liked their suggestions so much I decided to try them all. But how could I be in four different places at the same time? Remote cameras! This possibility was exciting, but I had never set up a remote camera before, let alone three of them. I had some research to do, so I turned to the Sports Shooter archives and read all I could about remotes. Sun staff photographer and Sports Shooter member Karl Ferron also helped me greatly with this subject. Thank you Karl and Sports Shooter! The next step was gathering all the necessary equipment. It took some sweet talking and many promises to not drop the equipment in the water, but other photographers graciously let me borrow their extra Nikon bodies and Pocket Wizards. Also, special thanks to Deputy Director of Photography Jeff Bill. He facilitated my every request for loner equipment to help compliment my personal Canon equipment. Spectators watch from the water as the ponies finish their swim across Assateague Channel. I arrived in Chincoteague Island two days early to scout out locations for the remotes and to talk to the fire department in order to finalize the details. My initial plan was to shoot from a boat with the 1D and DCS 520 and use the three Nikons as remotes on land. My next step was finding places to mount the cameras, without risking them being trampled or stolen. I found a pier about 20 yards away from the estimated location the ponies would be coming out of the water. I thought this would be perfect until I learned it was a private pier and no media would be allowed access without the owners' permission. I still had one day before the event, so I went door to door and asked the condo owners, who each owned part of the pier, if I could set up some cameras. They all were very accommodating and agreed. One family who was renting a two-story condo 100 yards from the shore was even willing to let me set up a remote with a 500mm lens on their second floor deck. They also allowed me to store my extra gear inside the condo during the event, so I wouldn't have to worry about theft. That night, I went out on the pier and practiced setting up the remotes. Once I found the ideal location, I used gaffer's tape to mark the locations of the super clamps, so I could quickly set up the next morning. I then did a dry run to make sure everything was working properly and went back to my hotel to watch the weather channel. There was a 60% chance of scattered showers throughout the night and day. I knew that if it rained during the event, I would have to scratch my plans at using the remotes. 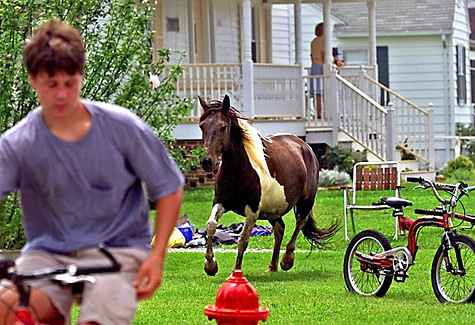 Despite the efforts of the Salt Water Cowboys, a pony gets loose in downtown Chincoteague while on its way to the fairgrounds. The next morning, I arrived on site at 7:30 a.m. and surveyed the scene. It had rained heavily throughout the night, and the only public path leading to the water was now a muddy swamp. Spectators who were beginning to arrive had no choice but to brave the knee-deep mud. Because I had permission to use the pier, I could bypass the swamp. I had all of my remotes setup within an hour and then waited. The estimated time of the swim was anywhere from 11:30 a.m. and 1:30 p.m., as we had to wait for the optimal tide for the ponies to swim. Around 11:00 a.m., I got in the boat that would be taking me out. By this time, thousands of spectators were lining the shore; some waist-deep in the water while others climbed up trees for a better view. There were also hundreds of people in boats, jet skies, canoes and kayaks. As the ponies got closer, I double checked all of my camera settings and got ready to shoot. 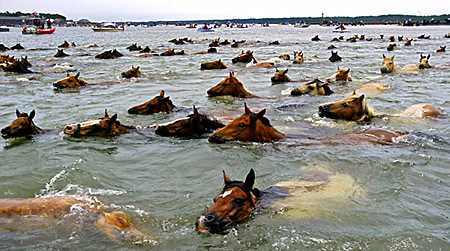 About 150 ponies entered the water at 12:01 p.m. and began their swim across the narrow channel. I could hardly believe the spectacle I was witnessing. I tried to get a variety of different shots by using both the 16-35 and 100-400 lenses. I also prayed the remotes were working, as they were set to take a picture every time I shot with the camera I was holding. The swim lasted only about five minutes and then it was over. When I got back on land, I took down the two remotes on the pier and stored them in the condo with the other DIH and 500mm. I had only a few spare minutes before the ponies would be paraded though the streets on route to the carnival grounds and I needed to secure my spot on the press truck. I took my seat on the back of the pick-up truck just as it was pulling away. I quickly changed my CF cards and batteries and focused on the second half the event. Thousands of spectators lined the streets of Chincoteague as the Salt Water Cowboys herded the ponies by. For the most part, the cowboys did a good job at keeping the ponies together; the few that did break away were quickly rounded up. During the final leg of the parade, I decided to try a different angle, so I jumped off of the press truck and continued shooting while lying along the side of the road. Just after the ponies were corralled at the carnival, it began to pour. Luckily, my hotel was close, so I went there to edit and transmit my photos. Overall, I am very happy with how events played out and the images I made. I know I would not have been able to do everything I did without the preparation, pre-planning and contacts I made long before the actual day of the pony swim. Finally, I would like to sincerely thank the entire staff at The Sun for making this one of the best summers of my life. Thank you for challenging me to continually push myself and not to settle for the expected picture. I had a great time working in Baltimore and have learned a tremendous amount from all of you.